We have decided to take a look at how the extruder of a FDM/FFM 3D printer looks like in terms of temperature when seen through a thermal camera. Normally 3D printers that extrude thermoplastic materials used as their filament material operate with a temperature of their extrusion nozzles in the range of about 200-250 degrees Celsius, though some materials may work with a bit lower or higher temperatures. 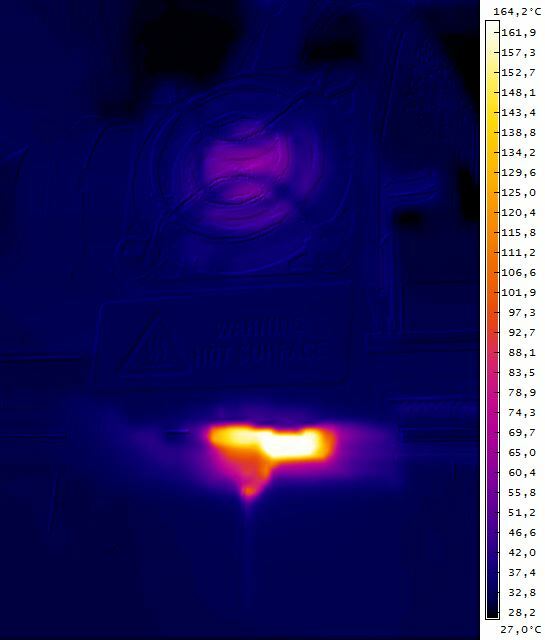 The thermal image above shows the extruder of a MakerBot Replicator 2 3D printer heating up to 230 degrees Celsius and getting ready to start printing with PLA thermoplastic material. The reported temperature by the printer is about 200 degrees Celsius at the time of taking the thermal image and the thermal camera shows about 165 degrees Celsius on the outside of the aluminum heating block where the heater cartridge is placed and to which the printer nozzle is directly attached. The temperature detected by the thermal camera is a bit lower than that of the 3D printer’s thermal sensor due to the fact that the aluminum heating block is covered with ceramic thermal insulation and taped over with Kapton tape, so the external temperature over the insulation is expected to be a bit lower.